When Andrew Glincher, CEO of the Global 100 law firm Nixon Peabody, broke the news to his attorneys in Washington, D.C. that he was remodeling and that everyone’s office was going to be the same size, he got some pushback. But Glincher made it clear he was not thrilled with the concession. He informed the recalcitrant space hogs that they would be required to pay the difference each month between what their space was costing the firm and what the smaller uniform spaces were costing. “Nobody took me up on it,” Glincher said of his offer. That was in 2015. Since then, Nixon Peabody has equalized its offices in Los Angeles and in New York City. This January, the firm’s offices in San Francisco and Boston will get the same treatment. Glincher says it’s all about developing a work space that demonstrates the firm’s unique values and culture. In Washington, D.C., the average size of the offices is 140 to 150 square feet. 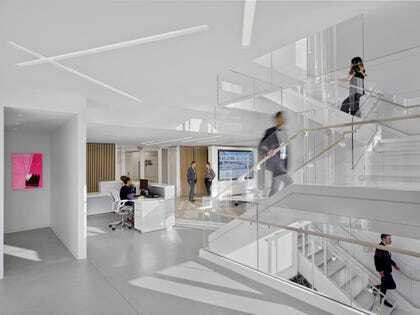 In San Franciso, offices will average about 120 square feet. There are some architectural challenges – beams and other obstacles – but the space is gutted to start from scratch for the best chance to achieve parity among office spaces. Crain’s New York Business noticed Nixon Peabody’s renovation in 2017. The law firm’s office was named one of Crain’s 5 coolest offices in New York for 2018. Glincher extends his groundbreaking approach to attire, favoring business casual for both men and women. If he’s asked to speak somewhere, Glincher usually dons a suit and tie, but sometimes goes with an open shirt. On Fridays in the summer, it’s blue jeans and a golf shirt for the CEO. Glincher says his approach has resulted in more than transparent offices and casual dress.